This is a map of the Mississippi counties that are included in the Northern District of Mississippi’s United States Bankruptcy Court and how they are divided for Chapter 7 Bankruptcy cases and also for Chapter 13 Bankruptcy cases. (Unless otherwise specified, the division is the same for both types of bankruptcy cases) The color coding shows you which counties are covered by which Judge. 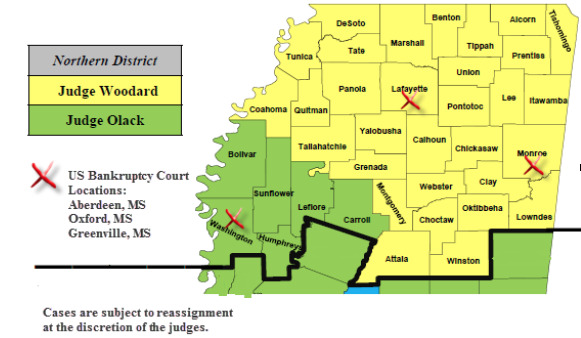 All of the green counties would appear in court at the Greenville, MS United States Bankruptcy Courthouse (Washington, Humphreys, Carroll, Leflore, Sunflower, and Bolivar). Note: Only hearings are held at the Greenville, MS location. The counties in yellow are split between the Aberdeen, MS United States Bankruptcy Courthouse and the Oxford, MS location. Note: Only hearings are held at the Oxford, MS location. The DeSoto, Tunica, Tate, Marshall, Benton, Tippah, Union, Ponotoc, Calhoun, Lafayette, Yalobuisha, Tallahatchie, Quiman, and Panola counties would appear in court at the Oxford, MS location. The Attala, Grenada, Montgomery, Alcorn, Prentiss, Tishomingo, Itawamba, Lee, Chickasaw, Monroe, Clay, Webster, Choctaw, Oktibbeha, Loundes, and Winston counties would appear in court at the Aberdeen, MS location. To view the calendar of Court Hearings / Meeting of Creditors, click here. The Northern District of Mississippi Bankruptcy Courts are a part of the US Trustee Program - Region 5, and Ronald H. McAlpin, Assistant United States Trustee, is located at the Jackson MS United States Bankruptcy Courthouse. When you file a Chapter 7 or a Chapter 13 bankruptcy case, the court’s Electronic Filing System assigns a court location, a Judge, and a Trustee to your case. Regardless of which type of case you file, the US Trustee remains the same. Then a date for your Meeting of Creditors is scheduled by the same system and it is set for approximately 30 days after the day your case is filed. If you do not see your county listed above, take a look at the Southern District of MS United States Bankruptcy Court.